Gato is quite grumpy. The reason behind this is up for interpretation. It may be because he prefers beef but usually receives chicken. Or potentially because he continues to be paired with English speaking gringas who want to pet his head more than he likes. Or even better yet, perhaps it’s because he’s 17-years-old and just plain deserves to act however he wants. No matter what the reason, his grumpiness is far outweighed by his teddy bear eyes, loyalty (he always looks back for the 2nd person), and love of belly rubs (when he’s not grumpy, that is). In short, I’ve already said “I love you,” and it’s only been a week. 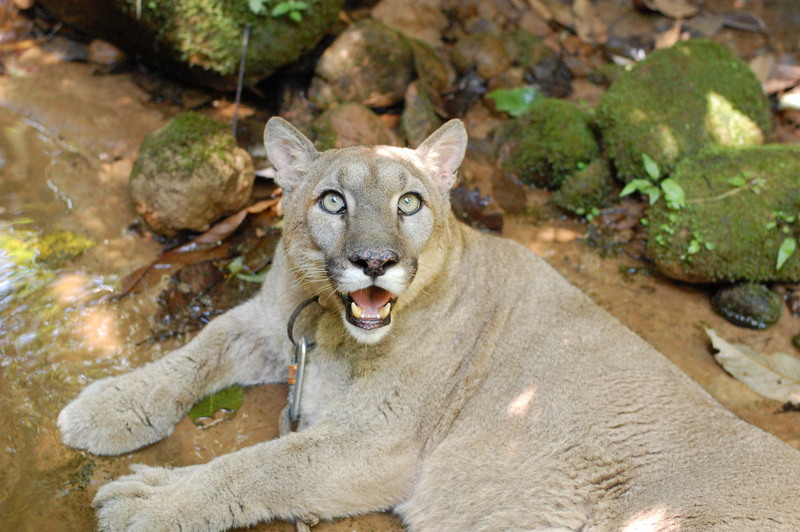 Upon my arrival at Inti Wara Yassi in Villa Tunari, Bolivia, I was paired up with Gato the puma for my month of volunteering. After nearly a year of dreaming about the experience, I couldn’t believe my luck! From 9am-4:30pm I would traipse through the jungle with my new feline best friend (second only to Dixie, of course). Besides a collar and long leash, Gato gets to make the decisions each day—which of his designated trails he’d like to take, where he’d like to nap for 2-minutes or 2-hours, and what time he’d like to go back home (although we’ll try to persuade him as best we can). One of IWY’s major goals is to provide a life that closely mirrors life in the wild for animals that can never be released. Each animal here has a unique story—from an ocelot with an autoimmune deficiency resulting from the early death of her mother to a capuchin monkey with severe emotional issues after being punched by bar patrons for the first 5-years of its life—they have all been lucky enough to end up in the hands of people who genuinely want to see them happy. The animals here have it pretty good, all things considered. However, Gato’s life did not start out so comfortably. His mother was killed for her pelt when he was very young and he was then sold to a Chilean travelling circus. They fed him only bread and milk as they tried to teach him to jump through a ring of fire. When the circus made a stop in Villa Tunari many moons ago, some local children told the folks at Inti Wara Yassi about the terrible living conditions of the animals. After working out the legal and monetary details, Gato arrived at the sanctuary. His tail was severely burned, he was quite aggressive, and he was unable to walk. The insufficient diet had left him crippled, as his feet and head had grown to normal size but the rest of his body never caught up. It took nearly one year of direct volunteer-to-puma rehabilitation before he was able to walk on his own and no longer acted aggressively towards humans. Thankfully, he has never looked back. I will continue to provide updates on my love affair with Grumpy Gato as the month continues. I really want to hear him purr at least once, but I’ve been told to not keep my hopes up. Some photos have been added from our walks. Meow! Pretty lucky kitty to have gone from nightmare to big cat paradise because not all people are abusive monsters and some people really do care. How can I donate to the sanctuary fairy and help them help other poor abused animals?